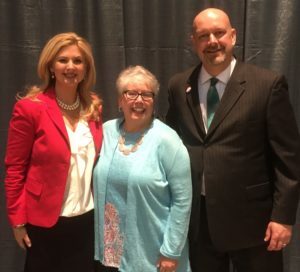 Last weekend in Lansing, delegates to MEA’s Representative Assembly elected Herbart to replace current MEA President Steven Cook, who is retiring on Aug. 31 after six years in the position. Delegates to MEA’s highest governing body heard remarks from Cook and considered a variety of new business items. Also elected on Saturday were a new Vice President, Chandra Madafferi, a high school health teacher and local union president from Novi in Oakland County; and Secretary-Treasurer, Brett Smith, a fifth-grade teacher and local union president from Linden in Genesee County. In his final speech before more than 500 delegates, Cook said the new officers face difficult challenges from lawmakers who want to weaken MEA in the hopes of further privatizing and charterizing public education. But we’re still here – and united we’re the strongest advocates for supports for educators and the quality schools every child deserves, he said. MEA’s current Vice President Nancy Strachan is also retiring at the end of August, along with Cook. Current Secretary-Treasurer Rick Trainor will be returning to his position as a teacher in Mt. Pleasant. In other action, RA delegates approved four New Business Items, including a proposal to add recycling containers at meeting and eating spaces at MEA headquarters; to establish a New Member Taskforce to look at ways to attract and involve new educators in the union; to study the possibility of reducing the Spring RA to one day instead of two; and to require a written report at each RA detailing the status of merger discussions between MEA and AFT Michigan.